How to use the web to promote your (photography) business. - … catching light in motion! / How to use the web to promote your (photography) business. In 2008 Photography by Depuhl pursues its online network in earnest …… reaching out to clients, friends and prospects via LinkedIn. This becomes the basis for a new level of engagement with people for us. At the same time my blog ‘catching the light’ begins – although at that point I just post what is interesting to me, not expecting much out of it. The website is also reworked to better display images and to have a more professional branding across all of my communication channels. In late 2008 I implemented a cloud based CRM, by using Salesforce.com, now my website is tied in to my client services back end – taking a request for photographing people, products or places and automatically notifying me as the information is being entered into my client database. The photography back end of my website also changes using Photoshelter as a backbone to serve up my images online. Proof of this approach working is in the jobs I receive from my network and people that find my website via organic search results and book me as a photographer through my website. In 2009 Social Media becomes a more important part of PbD’s web presence – you can find us on twitter, facebook, LinkedIn, … and ‘catching the light‘ my blog is receiving more and more attention. I am now posting articles not just about me, but about what I am learning about SEO, how to utilize the web in your online business, and also stories about my photography. Proof of this approach working is in the photos resold after blogging about them, and my website becoming more popular as seen just last week where my photography business is named ‘a favorite place on Google‘. What is going to be new in 2010? None of the pieces of this web presence is ever finished. So I continue to build my network (online and offline), I continue looking at how redesigning my website and social media channels can push my business forward (A new and improved website design-both design wise and SEO wise-is in the making.) 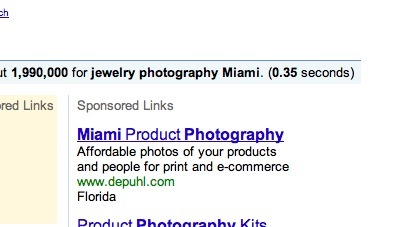 PPC advertising on Google and other social networking channels will be another portion of Photography by Depuhl’s online presence and I am also looking for more services that I can offer my clients to help them grow their business and make their interaction with my photography studio easier. It never stops, but it’s been a great few years now with many lessons learned and all of this done spending a lot less money on this (web hosting fees, URL registrations, software, web based services, PPC advertising, …) that a single yearly ad would have cost me a few years ago. Merry Christmas and an awesome new year of 2010!